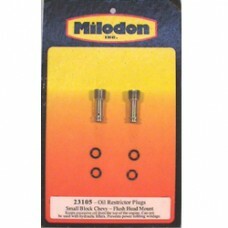 Milodon oil flow restrictor plugs solve the common high-performance engine problem of too much oil in the head area. The plug restricts approximately 75% of the oil to the top of the engine for better lubrication and prevents oil wastage at the lifters (a cause of windage problems). This helps retain oil in the sump. Install easily in the back of the block in place of the stock plugs. Not for use with hydraulic lifters. For late model Small and Big Block Chevrolet Bowtie, Rocket and Merlin blocks. Plug has an Allen head to allow flush mounting in the block and is made of stainless steel to avoid stripping out on removal.